Topped with a cute elephant and wrapped with pretty ribbon, this diaper cake is so darling! Tera submitted her diaper cake and her "recipe" below, which gives the rest of us some helpful tips for making our own diaper cake. 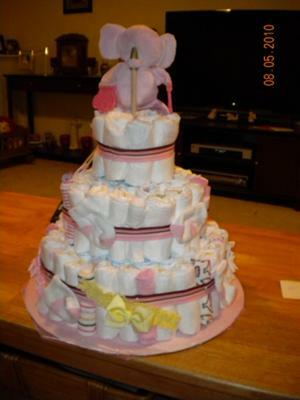 We love receiving everyone's baby shower ideas at this website and posting them for everyone else to enjoy - Thanks so much Tera for submitting your wonderful diaper cake! It is a perfect way to celebrate a baby girl! The 'ingredients' for this cake include: 93 (size 1) diapers, 20 baby washcloths, 6 pair newborn socks, 1 pair newborn booties, 3 travel-size lotions, 3 infant headbands, 1 pacifier, 6 large rubber bands, and countless corsage pins. Large cardboard circle used for the cake 'plate' and a thin wooden rod was put into the very center of cake to hold cake topper. Perfect for a little girl's nursery that will be brown and pink with elephants and giraffes!!!! 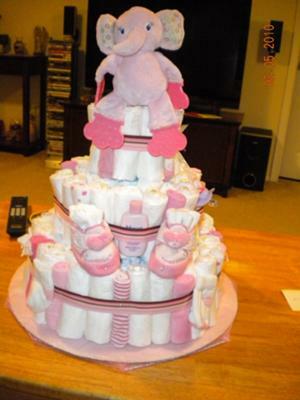 What a beautiful and unique picture of a diaper cake for a girl! This cake is really very impressive and attractive for guests who came to the baby shower. Thanks for sharing such a beautiful article...I hope every one will like it! THASS WAS SOOO AWSOME ,,I WAS LOOK FOR IT ,, MY DAUGHTER GONNA HAVE A BOY ,,, WONDER U MADE FOR US ?? ?